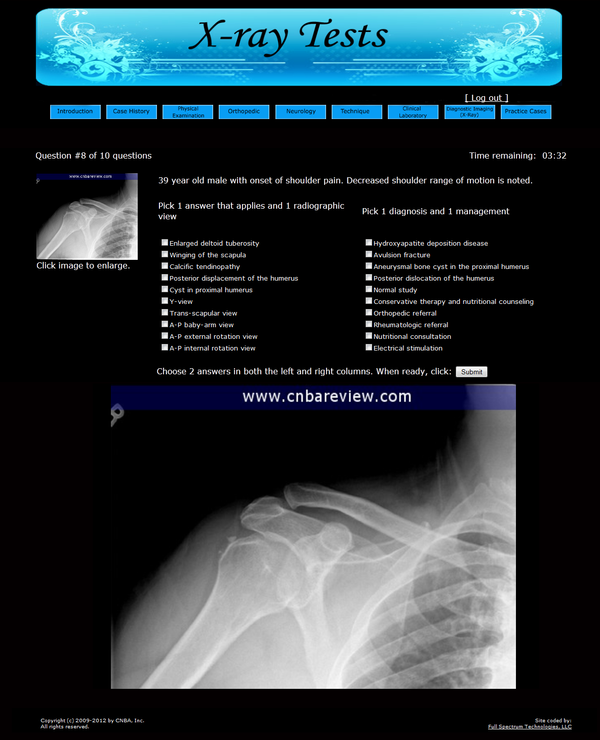 CNBA Diagnostic Imaging Part 4 Review. NBCE X-ray chiropractic part IV review. NBCE DIM part 4 chiropractic national board review. Chiropractic national board review part 4. 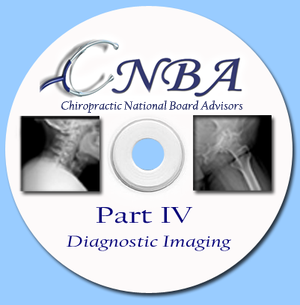 NBCE Chiropractic National Board Diagnostic Imaging Part IV tests and examinations. The Diagnostic Imaging review contains general review notes on the most common conditions presented during the NBCE part IV Examination as well as multiple practice tests/examinations for you to test your knowledge. This is the main feature and the highlight of the Diagnostic Imaging review. 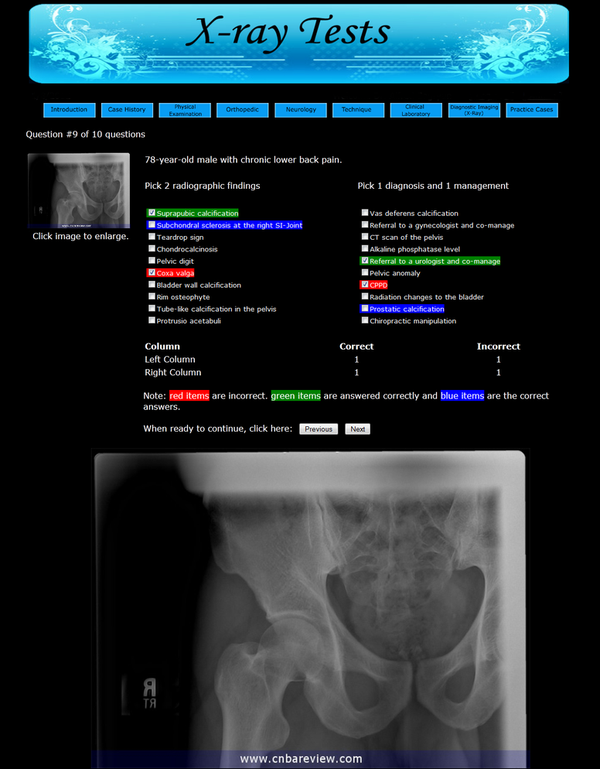 This section allows you take multiple practice exams/tests with digital x-rays to help you prepare for the actual examination. The style of the questions and the types of cases presented are highly similar to the actual NBCE Part 4 X-ray Examination, and we are certain that these practice tests will give you the knowledge and the confidence you need to do well on the main examination. 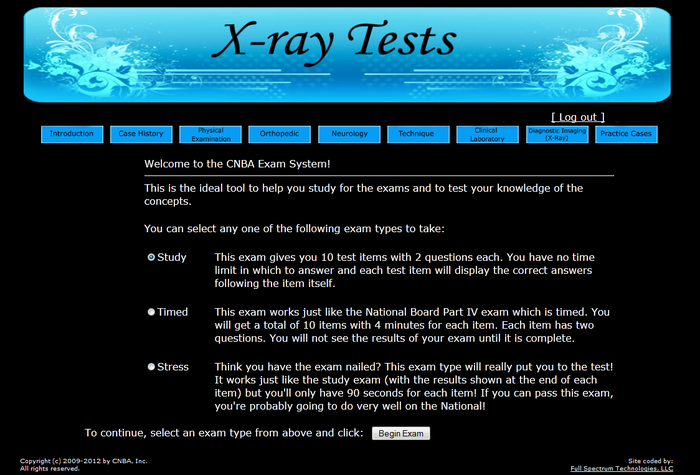 The image below is the homepage of the X-ray Testing section of the software. It explains all the options you have and the type of examiantion/test you can choose to take. The image below is a sample of a "study" examination where no time limit is set. After your answers are chosen and submitted, the answers are automaticaly displayed as shown below: Green item(s) indicate that you have selected the correct answer(s). Red item(s) indicate that you have selected the incorrect answer(s). The Blue item(s) are the remaining correct answers, which you did not select. The system will automatically grade your examination at the end and a score/percentage will be presented based on your performance. The image below is a sample of a "timed" examination where 4 minutes are given to answer each question/station (just like the part IV national boards). After your answers are selected and submitted, it will take you to the next station/question. After all 10 stations are completed, the system will automatically grade your examination and a score/percentage will be presented based on your performance. The system will automatically select the case/image. There are multiple cases in the review system for you to practice with. You will have the opprtunity to take multiple examinations with this software and new cases will be constantly updated to the system. With the "stress" examination, you will only have 90 seconds to answer each station/question. After your answers are chosen and submitted, the answers are automaticaly displayed: Again, green item(s) will indicate that you have selected the correct answer(s). Red item(s) will indicate that you have selected the incorrect answer(s). The Blue item(s) are the remaining correct answers, which you did not select. The system will automatically grade your examination at the end and a score/percentage will be presented based on your performance. If you can do well with the "stress" examination, then you are certainly ready for NBCE Part 4 Exam!.